The Games People Play - Box Brown Review — GamingWithSwag.com - Dads By Day, Gamers By Night. I love Tetris. A lot of people love Tetris. But not for the same reasons I do. 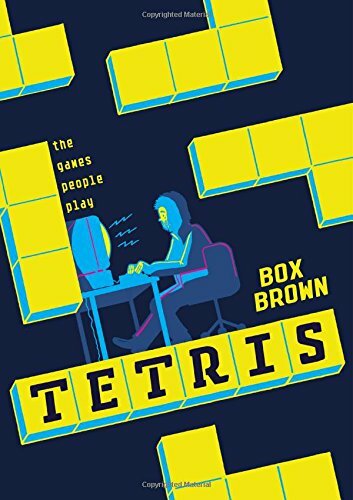 See, I'd like to think that author Box Brown and I share something in common: That the history of the making and production of Tetris is the most interesting part of it's existence. Now, I don't want to give too much away, (plus you can look at any Wikipedia article to give you an overview) of what happened. But after genius Alexey Pajitnov created the excellent puzzle game we all and know and love today comes the real story. A tale of multiple companies claiming rights to an instant classic, multiple versions being released simultaneously on various platforms, and even love, death, and sorrow. Box Brown does a wonderful job in his graphic novel The Games People Play: Tetris in explaining what went down during the creation and distribution of Tetris. He takes a complex story that has been told several times in various video game history books and breaks it down into a comic-strip like format that engages the reader and encourages them to keep turning the page. And that really is where this book succeeds. I found myself engrossed in this book and it only took me a few hours to complete. Funny enough, this is also the same premise that got everyone hooked on Tetris. There is something extremely attractive about a concept so simple and be completely hooked. My only issue with this book is there is a major part somewhat skipped over in the lore. Although Brown does mention the strife that was had between Tengen and Nintendo, there is one thing to be clear here: Tengen's version of Tetris was better. Two player simultaneous is how Tetris was meant to be played, and is why the Tengen cartridge is so sought after today. Featuring head-to-head and a unique co-operative mode, the Nintendo version is far inferior to the unofficial Tengen competitor. Alexey is obviously a genius. Regardless, Brown has done a wonderful job with this graphic novel, and if I had it my way I would love to see future video game titles and stories examined in this "The Games People Play" format. A plethora of obvious candidates exist with stories like the creation of the Sony PlayStation system and Sega hardware turmoil (Sega CD, 32X, and Saturn). There is a world full of potential here for Brown, and I truly hope he capitalizes on this. It's not often you have a skill or talent that not only educates the populace but also entertains. I highly recommend The Games People Play: Tetris, and at a cover price of only $19.99 you should go buy it now.